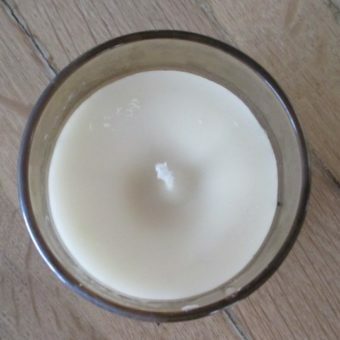 Our soy wax is intended for use in soy candles. Even though pure soy wax works very well in candles, our customers regularly ask what they can blend with the soy wax to reduce cost. We tested two easy candle blends to see what would happen. If you would like to make a massage candle you could blend the soy wax with other exciting things, like vegetable butters and oils, to make a soy massage wax. We give you three of Dr Google’s best sample recipes for soy massage wax at the end of this blog post. This candle was made with a blend of soy wax and stearic acid. The results weren’t great. Before you want to add something to the soy wax, ask yourself what you are hoping to achieve. This candle was made with a 50 : 50 blend of paraffin wax and soy wax. 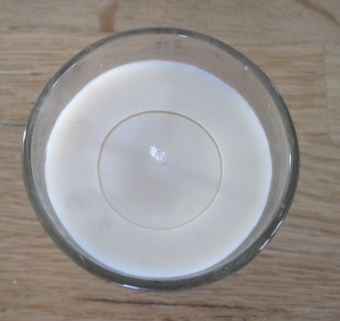 Because of the high paraffin wax content, the candle formed a dent in the centre as it cooled, which was disappointing. The upside is that the high paraffin wax content considerably reduces cost. Add Candle Deli’s quality fragrances to your candles for that “je ne sais quoi” that makes all the difference. This entry was posted in Tips and Ideas and tagged eco wax, soy candles, soy wax. How to Choose a Fragrance Oil for Cold Process Soap?